The Courteeners first burst onto the music scene back in 2007 with their debut album St. Jude. Where are The Courteeners from? A band known for celebrating their Mancunian routes, the childhood friends first found fame in their home city, after growing up together in Middleton – a town to the north east of the city. 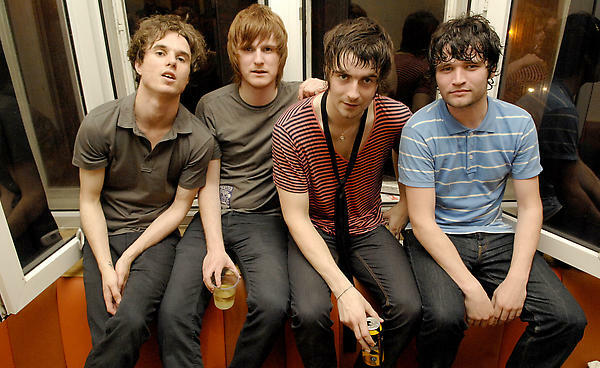 The indie rock band was initially made up of lead guitarist Liam Fray, Michael Campbell on the drums, rhythm guitarist Daniel Moores and bass player Mark Cuppello. However, Cuppello was later replaced by the band’s producer Joe Cross in 2015. Whilst studying Creative Writing at the University of Salford, Fray started focusing on his career as a singer-songwriter, performing acoustic sets around bars and at open mic nights in Manchester. After dropping out of University, he recruited his lifelong friend Michael Campbell to join his gigs around the local area. First performing under his name, it wasn’t long before the final two members signed up to complete the line up as The Courteeners. Their first proper gig was at Manchester’s now-defunct Roadhouse in October 2006. After gaining more and more exposure, it wasn’t long before the band’s popularity sky-rocketed. With some great material ready for their fans, written by the frontman himself, The Courteeners released their first single ‘Cavorting’ on Loog Records on 6th August 2007, debuting on the UK chart at number 192. A second single, 'Acrylic' was released on 22nd October 2007, reaching number 44 in the UK chart. With a friendship stemming from the age of ten, the band members all grew up listening to the same type of music, giving them similar influences. So, when The Smith’s producer Stephen Street approached the band to discuss a future working together, they knew they were on to something good. The band went on the release the song ‘What Took You So Long?’ in 2008, which reached number 20 in the UK chart. This was the start of something special! 2008 saw the band release their first album, St. Jude, which was launched at our very own Manchester store. As the new sound of the rainy city, hundreds of fans queued up for hours to see a glimpse of these five up- and-coming Mancs. In their early career, James frontman Tim Booth once compared Fray to the likes of music royalty Morrisey. And, following the release of their debut album St. Jude, which reached number four in the UK charts, U2 frontman Bono called The Courteeners "The best band of the past 10 years." With more and more doors opening for the band, they were asked to support the likes of The Stereophonics on their ‘Decade in the Sun’ tour. Playing to massive sold out venues like the Manchester Arena and the O2 Arena in London, this was just a taste of what was to come. When it came to cracking America, their debut show in the US saw the five Manchester lads join Morrisey as special guests on his ‘Tour of Refusal’ show. Following a month touring, playing at 18 shows, the band ended their Stateside adventure performing on the main stage at 2009’s Coachella Festival in California. So, if you’re a super fan, you’ll know that the band made up their name - The Courteeners - one day whilst practising in their garage. But, five years on in December 2012, they dropped ‘The’ from their name, preferring to be called, simply, Courteeners. The quartet have released 5 studio albums over the space of a decade. 05. 06. 15. 25,000 in our Back Yard. Can't wait to do it all again. 5,784 Likes, 159 Comments - Liam Fray (@what_liam_saw) on Instagram: "05. 06. 15. 25,000 in our Back Yard. Can't wait to do it all again." Entering the charts at number 19, the band released ‘Not Nineteen Forever’ on 31st March 2008. Five years later it re-entered the charts, after being named Manchester United’s official Premier League victory song, following their record twentieth league championship win. To mark this momentous occasion, on 13th May 2013, the Courteeners played a free set in the city’s Albert Square, as part of the club’s victory parade. And, in a bid to give something back, some of the proceeds from the re-released single went to the Manchester United Foundation, Francis House Children's Hospice and the Christie Hospital NHS Foundation Trust. 1. How old is Liam Fray? A child of the eighties, Liam Fray was born on 15th May 1985. 2. What inspired the St Jude album cover? The cover's artwork was designed by Courteeners singer Liam Fray himself, and features Audrey Hepburn. 3. Who wrote ‘What took you so long’? ‘Not Nineteen Forever' and 'What Took You So Long' were both tracks that were written long before Liam had even formed the band. If you want to shop all things Courteeners, you can find everything you need here.